Choose Allfen to play and it will bring you to a special dream. In this dream, the world is full of blocks, and there is only you standing and enjoying the strange beauty of this world. In addition, you can build something, which has a real human soul inside and prints your footprints of imagination on this land. In this land, you enable to build a house, make a robot, or create something very different from what people usually see. 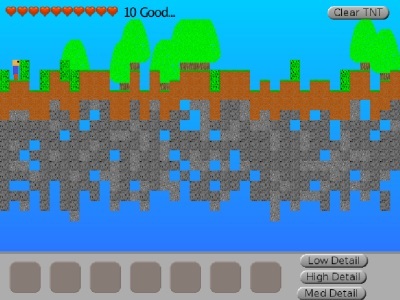 Without about 7 colors of 7 types of blocks, you enable to do something unique. By the way, you can pick up one among three modes to play consisting of Low Detail, Med Detail, and High Detail. Once you combine the click of the mouse and one key in the list which starts from Z to M, you are getting a specific material.